I am a motorcyclist, a woman, and middle age. 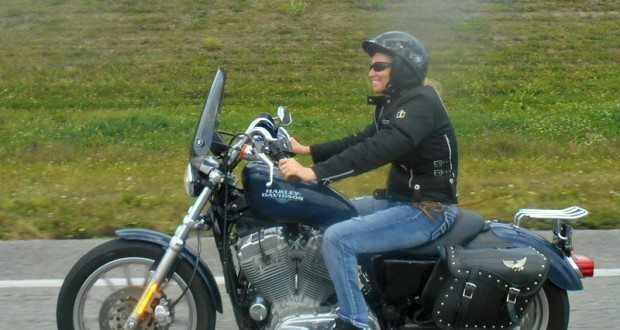 Like most women in my age group I didn’t get into motorcycling until later in life. Not that I wasn’t interested in it, in fact as a kid I used wooden clothes pegs to clip baseball cards onto the spokes of my bicycle and as I rode the rhythmic clicketty-clack of cardboard on metal transformed my average bicycle into a motorcycle. (At least in my mind) I would then race through my neighbourhood with no particular place to go. It was that sense of feeling free and oh what a rush as I leaned into a curve. Growing up I never had the opportunity to even get near a motorcycle but that rush I had as a kid on my bicycle never left. So the years slipped by while life and it’s circumstances seemed to keep my dream of riding a motorcycle at bay, and I placed it on the back burner to simmer. Before I knew it middle age was creeping up on me way too fast and that pot of dreams was starting to boil over. It was the day of my 44th birthday I had a ‘now or never’ kind of moment and decided that come the spring I was going to just ‘Do It’. At the time I didn’t even give it a second thought that I had never actually ridden one yet. So in early April of 2009 I bought a motorcycle handbook and a week later took the written test. As I walked out with my learners permit in hand and a silly grin on my face I hopped into my car and it occurred to me I was missing one very important thing, a motorcycle! But then a wave of terror swept over me, I had no clue how to even ride one! I was determined not to let fear or anything else prevent me from finally achieving my dream and that is when I decided that taking a motorcycle course would be in my best interest. After signing up for a course that was to start in mid May I was on such a natural high that I wasted no time shopping for my motorcycle. The moment I stepped through the doors of the Yamaha dealer a small slender beauty caught my eye. Dark red with a hint of sparkle captured that perfect mix of dainty and dangerous. As soon as I sat on the little V-star 250 it was love. Call it destiny, excitement, impulse… all I knew was she was the one. (Although I have to admit, I had to get my boyfriend to drive her home for me). Then finally a few weeks later the weekend of the course arrived and it poured rain, but that didn’t dampen my spirit to ride. Dripping wet, glasses fogged and hair plastered to my head, I had a smile from ear to ear the day I passed. Over the next year as I practiced and gained more confidence I already had my mind made up that I would take the second motorcycle course to earn my full M class. However, I was scared to death knowing that I would have to ride my motorcycle along a highway for the forty-five minute commute just to get to the motorcycle course. I came up with a mantra that I would say over and over in my mind “you can do this” and those four little words somehow gave me the courage to get myself to and from the course that weekend. On the final day my cheeks hurt from the permanent smile on my face when I earned my full licence. 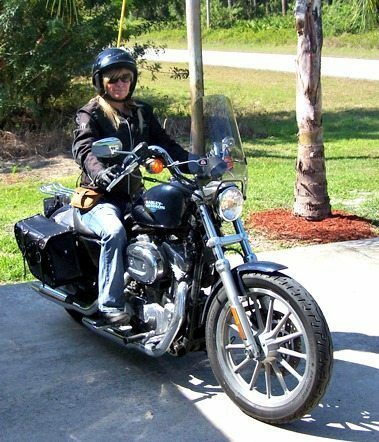 Four years later in 2013 I finally retired my little V-Star 250 and traded her in for a Harley Sportster 883 Superlow. Although there will always be a soft spot for my V-star, it was just time that I moved on. My new to me bike has opened a whole new world for me, much longer rides. Now, seven years later I still have that silly grin on my face from ear to ear as I ride. Editor’s note: Sandy is winging it as a writer, you can visit her website at theFrozenCanuck.ca, or check out the Frozen Canuck Blog. Thanks, Sandy. Keep on smiling! I identify with this story so much, 46 years old making the decision to ride, taking courses to get my license. I rode on the back of my husbands bike for 28 years. Progression of bikes from a 50cc scooter to an old Honda CM450, VT500 and now my Honda NC700 sport tourer. I love riding and this 6 year journey led to me becoming a motorcycle instructor, quite the ride actually from a 50cc scooterist to a motorcycle teacher in six years of riding. I love hearing the stories of others and they can be truly inspiring.